Knowing the protocol of a wine tasting tour enhances everyone’s experience. The wineries of the Yakima Valley have established a set of protocol that most wine lovers adhere to. The following is an outline of what to do while enjoying this year’s Spring Barrel Tasting event. 2. Plan your itinerary: Visit between 3 and 4 tasting rooms per day. Get the true tasting experience by lingering at each winery. A true tasting will allow you time to let your sensations pay attention to the flavors of each wine. Plan your itinerary so that at lunchtime you end up at a winery that has a picnic area. 3. Please drink responsibly: Discover the flavors of Yakima Valley by sampling and drinking in moderation. Alcohol consumption is limited to people 21 years or older. 4. 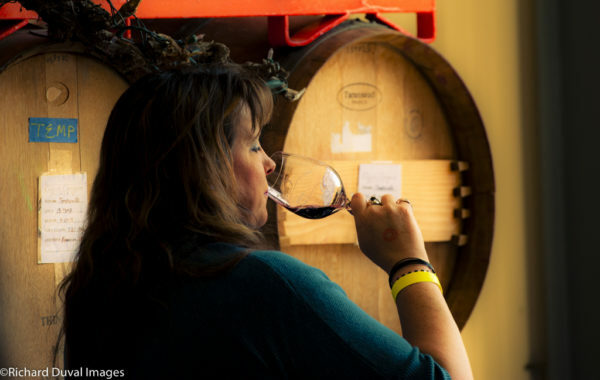 Wine tasting etiquette: You and other wine tasters want to be able to evaluate a wine’s aroma without competition: avoid wearing strong scent or smoking immediately before visiting a tasting room. Be assured that it is “O.K.” to pour out the remainder of a sample of wine which you don’t finish. Tasting rooms usually provide a container for this purpose. 5. Explore beyond your favorite wines:Every winemaker has a unique style and manner of finishing his/her wines, so a variety of wine (Merlot, Chardonnay, etc.) will taste differently at each winery. This is a great chance to taste wines that pique your curiosity. 6. Ask questions: Whether you are a novice or expert, you will find friendly, knowledgeable hosts in the Valley’s tasting rooms who want to pass on their passion for the Yakima Valley and the quality wines produced in the region. In fact, many times in the Yakima Valley, the person behind the tasting room counter is the owner and or winemaker. These committed wine enthusiasts love to talk wine, so a simple question can get you valuable information. Many wineries even supply you with their own tasting notes about the wines as well as information about the vineyard sources and growing conditions.